City Market of Los Angeles project approved by L.A. Planning Dept. 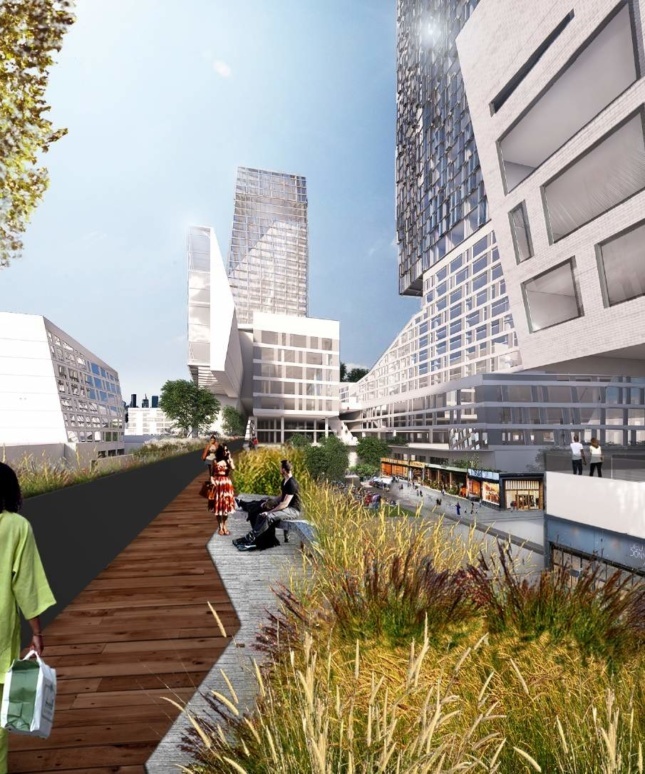 - Archpaper.com City Market of Los Angeles project approved by L.A. Planning Dept. A plan crafted by developers City Market of Los Angeles and architects Hanson LA to drastically reshape a large section of the Los Angeles Fashion District in Downtown Los Angeles was unanimously approved by the Los Angeles City Planning Commission (LACPC) yesterday afternoon. In all, the roughly ten-acre development includes 16 development sites that will ultimately render up to 945 residential units, a 201-key hotel, 312,000 square feet of educational and creative offices, 225,000 square feet of retail spaces, and 272,000 square feet commercial office areas if built according to current plans. Hanson LA is serving as the master plan architect for the project, and the firm has developed the site plan for the project as well as written design guidelines for the development that will guide “what we do for the next 100 years” on the site, Doug Hanson told The Architect’s Newspaper (AN). Hanson, a principal at Hanson LA, said the plan includes establishing a site-spanning amenity level roughly 20 feet off the street that will connect various blocks by spanning over the sidewalk. The elevated park is set at the height of neighboring industrial structures in order to maintain a contextual relationship with the neighborhood. The terrace, according to Hanson, will “speak to the history of the site” as an industrial district populated by warehouse structures. The designers hope that the elevated park spaces can provide much-needed public seating and gathering spaces for the neighborhood. The two-block-wide development will be bisected along the ground floor by a series of retail-lined pedestrian streets, with the terrace level above spanning between new structures to create an outdoor mezzanine promenade. 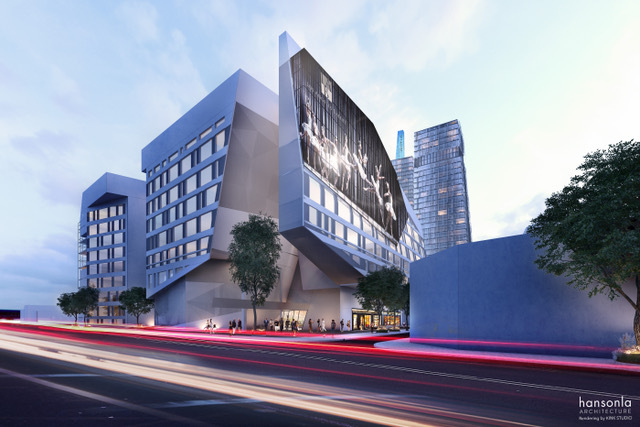 The designers released a set of new and updated renderings for the project in anticipation of the LACPC meeting that highlight the multifaceted urban dynamic the firm has sought to articulate across the site. Site design for the project has been guided by a desire to have “quality architecture” populate public and semi-public open spaces while maintaining view corridors toward iconic downtown vistas. 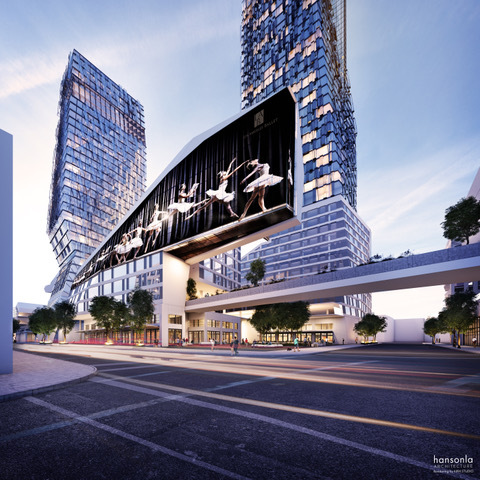 “These aren’t massive, big buildings,” Hanson explained as he described the articulated and setback low- and high-rise placeholder forms that show up in the renderings. Structures will ultimately be designed by a variety of architectural teams according to Hanson’s guidelines and will rise from a single story up to 454 feet in height. The plans envision a sizable portion of the site dedicated to housing a satellite campus for a local university as well as a 744-seat multiplex theater, Urbanize.la reported. The developers are also seeking to transform the complex into a so-called “sign district,” a local designation that allows for the installation of large-scale, electrified advertisement and mural billboards like those coming to nearby areas. The Skid Row–adjacent development does not feature an affordable housing component but will pay over $11 million toward a funded dedicated to preserving and creating new affordable housing in the neighborhood. The project will next be reviewed by the Los Angeles City Council for final approval. A timeline for the project’s implementation has not been released, but the developers envision a roughly 20-year construction timeline for the development, depending on market conditions.